In 1865 London Zoo obtained a baby African bull elephant from the Jardin des Plantes in Paris in exchange for a rhinoceros. Under the care of his keeper, Matthew Scott, he grew to a huge size even by elephant standards, and acquired the name Jumbo (possibly a mishearing of the Swahili word jambe, meaning 'chief'). Jumbo became a star attraction carrying passengers, mainly children, around the Regents Park grounds. He also acquired a mate called Alice, who was housed in a stall next to Jumbo. For fifteen years he enjoyed the affection of an adoring public (even as elephants in Africa were being slaughtered wholesale for their ivory tusks). But perhaps boredom set in, for in 1881 he became increasingly grumpy and unpredictable, and the rides were stopped. Only Matthew Scott could control Jumbo with any confidence. Enter Phineas T Barnum, a maverick American showman alleged to have coined the phrase 'There's a sucker born every minute'. Barnum wanted Jumbo for his Greatest Show on Earth, a huge circus based in Madison Square Gardens in New York. He offered $10,000 for Jumbo and a relieved London Zoo accepted. But when news of the sale broke, there was uproar. Questions were asked in Parliament. Members of the Royal Family protested. Cartoonists depicted Jumbo in tears and Alice as a grieving widow. Music halls rang with Jumbo songs and sketches. Unrelenting, Barnum arranged to ship Jumbo to New York in a special crate, but the elephant kneeled down and refused to move until Matthew Scott accompanied him. Sixteen horses hauled the 13 ton crate from the harbour to Barnum's circus, as excited crowds lined the streets. Billed as 'The Towering Monarch of His Mighty Race, Whose Like the World Will Never See Again', Jumbo toured the US and Canada on a specially built rail wagon and was seen by an estimated 20 million people. But in September 1885, at the town of St Thomas in Ontario, Jumbo was being led to his wagon after the show when he was struck by a train and killed. 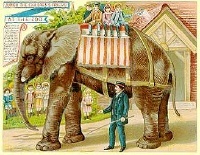 Always adept at exploiting an opportunity, Barnum had the skeleton stripped and the hide stuffed, mounted these on separate wagons and sent them on a 'funeral tour' with Alice and other elephants in tow. 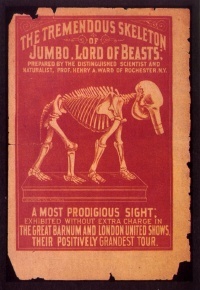 After a few years profiting from his 'Double-Jumbo' exhibits, Barnum donated the skeleton to the American Museum of Natural History in New York, where it still stands today. 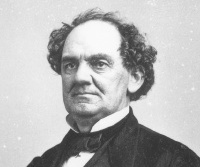 After enquiring from his partner, Bailey, about the latest ticket sales, Barnum expired in April 1891 in his Connecticut mansion. An inconsolable Matthew Scott went to care for small animals at the circus headquarters in Bridgeport, and died in 1914 in the city's almshouse. Not only his skeleton, but Jumbo's name survives as a word to describe huge examples of everything from passenger aircraft to sausages - and Colchester's Victorian water tower!